Tag Archive | "Crandon Park"
The inaugural Miami Tennis Cup will take place November 30th through December 2nd at the Crandon Park Tennis Center in Key Biscayne, Florida. 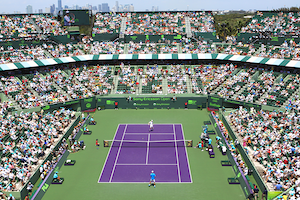 The Crandon Park Tennis Center also plays host to one of the most popular tennis events on the ATP and WTA calendar, the Sony Open Tennis. The Miami Tennis Cup will feature a “Super Six” format of current and former top ranked players from the ATP tour. Andy Murray, the 2012 US Open champion and Olympic gold medalist, will headline the event. Murray will be joined by Andy Roddick, John Isner, Nicolás Almagro, Alejandro Falla and Juan Carlos Ferrero. Miami, FL – Argentina’s Group NOS, one of South America’s leading producers of brand-immersive experiences in the sports and entertainment industry, has announced the first annual Miami Tennis Cup, taking place November 30th through December 2nd, 2012, at the prestigious Crandon Park Tennis Center in Key Biscayne, Florida. The highly anticipated competition is the first of its kind to launch in the U.S. and receives its inauguration in South Florida, featuring six of today’s top ranked ATP professionals, including an exclusive appearance by U.S. Open Champion and British Olympic Gold Medalist, Andy Murray, and French Open Champion Juan Carlos Ferrero, the former world number one player from Spain. The tournament will also be a tribute to the iconic career of Florida resident, Andy Roddick, who will also be participating as part of his homecoming farewell tour. The “Super Six” clash of the titans will play in a double-elimination, round robin tournament format that will also feature ATP heavyweights Nicolás Almagro (ESP), Alejandro Falla (COL) and top ranked American, John Isner. All matches played throughout the three-day tournament will take place on the stadium court at Crandon Park and will be broadcast LIVE by ESPN3. More than 7,000 spectators are expected to attend each day.